Chuck: The chuck is the shoulder of the animal and is also the largest primal. These muscles enable much of the animal’s locomotion and as such these muscles are considered working-muscle groups. Because they are constantly being worked, the muscles often contain large amounts of collagen and connective tissue. Because of this the chuck is considered to have the toughest texture but also the deepest flavor. Cut from a very hard-working muscle of the animal. Thus, contains a copious amount of connective tissue and needs to be cooked for a long period of time in order to break them down. Making this cut an excellent choice for pot roast. Boneless Chuck Short Ribs $8.99lb. These are boneless and very similar to a Prime Rib Steak. There are 2-3 steaks left on the neck of beef where the rib meets the chuck. Beef Cubes for Stew $5.99lb. Brisket: The Brisket is composed of two muscles, one known as the flat cut, and the other, the point cut. This coarsely grained cut is best prepared using slow-cooking techniques such as smoking or braising. Plate: The plate is part of the of the rib that extends to the lower half of the rib. Its subprimals include outside skirt steaks and short ribs, two of the deepest flavor you can find on the animal. Massive amounts of flavor on this small steak. Due to its thin and fibrous structure this steak has a very unique texture and retains well to marinades. Butterflied, rolled, tied and portioned then marinated. Rib: The rib is the only primal cut that you can practically cook as is. But with our knowledge and skill we fabricate this cut to make it shine. The rib provides you with more muscle groups and fat, resulting in more diversity of flavors. Cuts include: Bone-in or Bone-on Rib Roast, Bone-in or Boneless ribeye steak. Prime rib is traditionally prepared two ways – as portioned steaks or as a roast but can be portioned bone-in or boneless. As a roast one rib will feed two guests. Steaks are cut individually and are also known as Rib Eye, Delmonico (boneless) and Cowboy Steaks. Loin: Separated into two subprimal cuts, the short loin and sirloin. The loin provides you with some of the most tender cuts of the animal including: Hanger Steaks, T-bone Steaks, Porterhouse Steaks, Strip Steaks, Tenderloin, Sirloin Steaks, and Tri-tip for example. Filet Mignon or Chateaubriand $24.99lb. The tenderloin is prized for its texture. Its flavor is lean and elegant. Traditionally the tenderloin is prepared in two ways – as portioned steaks or as a roast. Bone-in Steaks that include both the tenderloin and the strip loin. To be considered a Porterhouse the cross section of a tenderloin must have a minimum width of 1 ¼ inches. Therefore, Porterhouse steaks come from the posterior half of the short loin, where the tenderloin is wider. T-Bone or Shell Steaks $14.99lb. Bone-in steaks cut from the anterior half of the short loin. Muscles are identical to the porterhouse but are smaller due to the tapering of the tenderloin and strip loin. Can be bone-in or boneless. Also known as New York Strip, Kansas City Strip & Boneless shell steaks. Boneless steaks known for their rich flavor and tenderness. Great for a gathering to be sliced. 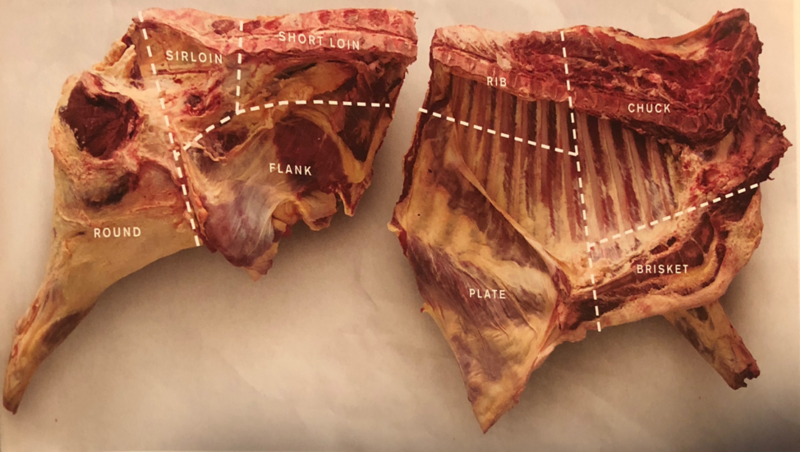 Flank: The flank is the only boneless primal in the animal and consists of only three cuts: the flank steak, inside skirt and the sirloin flap. All of which are thin, strong muscles that can benefit from some tenderization but most importantly be sure to slice these thin and across the grain. An easy and quick grilling steak. Popularized as the original cut for London broil. You can also use this for stir fry or Braciole. AGM Flank Steak Pinwheels $10.99lb. Butterflied and stuffed with parsley, mozzarella and aged Romano cheese, rolled, tied and portioned. Round: The round produces a lean and variably tender meat with moderate amounts of flavor. Subprimals are divided into eye, bottom or top/inside round and are typically cut into roasts being ideal for thinly sliced roast beef or braised beef dishes. If cut properly the round also works very well for larger marinated steaks. Top Round London Broil $7.99lb. Great option for a group of people. Typically cut 1 ¼ -1 ½ inches thick. Due to the natural leanness and mildness in flavor, this is a great steak for marinating. A lean, oblong muscle that slightly resembles the tenderloin, though its texture is drastically tougher. Best used as a roast beef to be sliced thin. 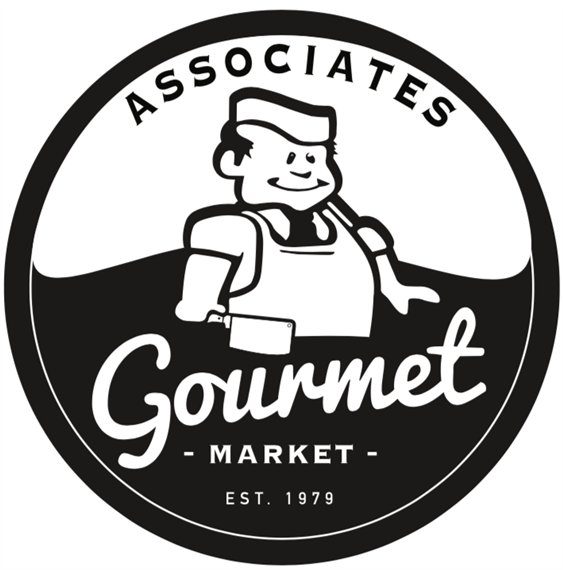 AGM Signature Ground Beef $5.99lb. Great ground beef makes a great butcher shop. We use a blend from the chuck, short rib, top round and sirloin. 6oz Hand Formed Burgers $5.99lb. Steak on a Stick $11.99lb.